Screen is a warped line across the screen. 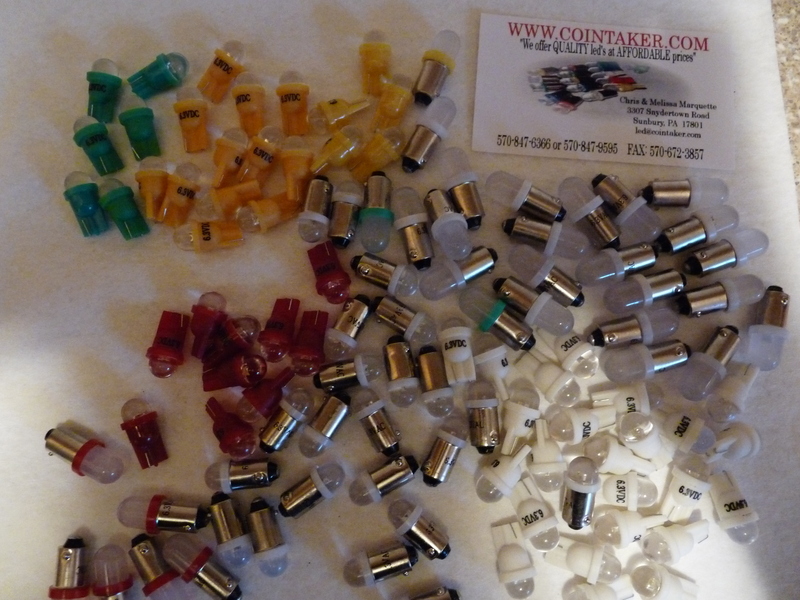 (insert colorful metaphor here)! However, the game booted, so I figure I must have done something right. Try to coin the game up, and no sound. I did exactly nothing that in any way should have been able to affect the sound system. With no picture beyond the thin line, I can’t tell if it took the credit without sound. So my brain starts chewing on the latest problems. 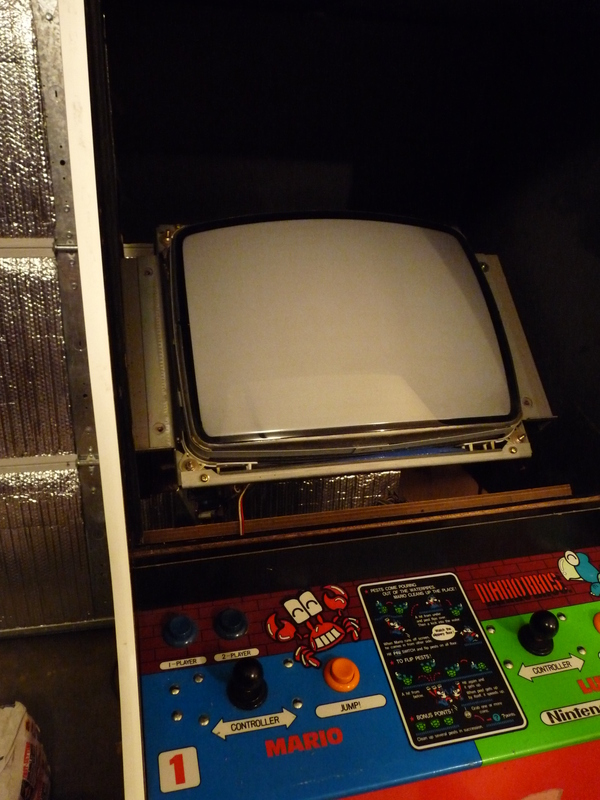 Need to pull the monitor for further testing, and jump the game board to an external monitor and see what I get on the screen. No problem. Except that my fist won’t unclench. 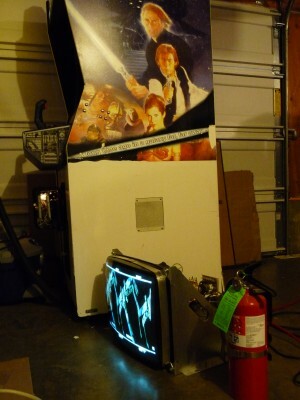 This is what is called ‘hitting the wall.’ I was actually getting angry at the game for not working. 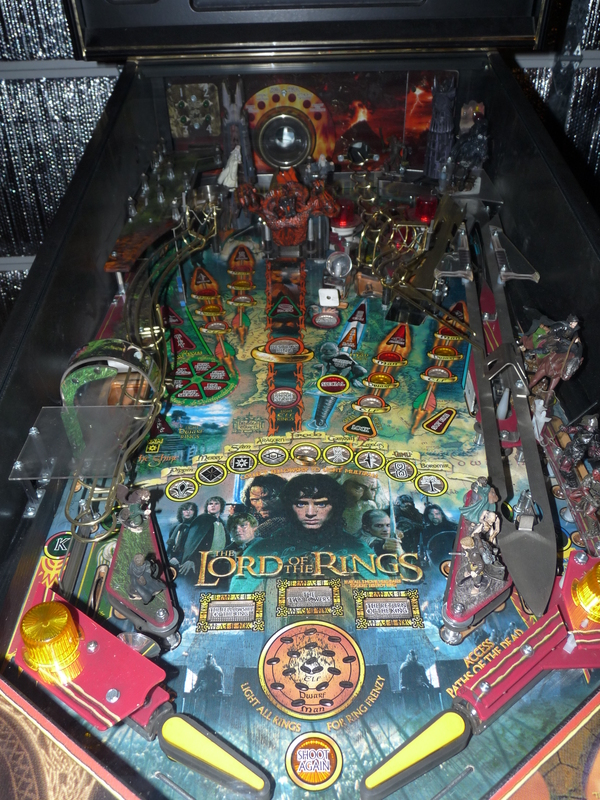 I’ve got several difficult projects going currently (needing to learn playfield repair for Addams Family, among other things. I didn’t post about the small fire in one of the pins I’m working on, did I? 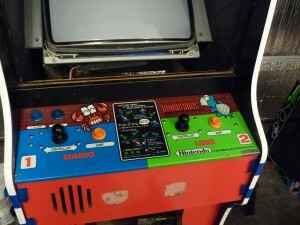 Hmm, next post, then) and really thought Marvel vs. Capcom 2 would be easy. So to make a long story short, I’m taking a break. 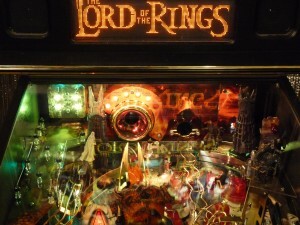 I love arcade games and pinball. I LOVE working on them. 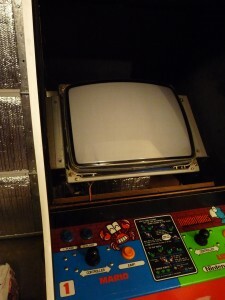 I spend a heck of a lot of time reading about arcade repair and restoration. In a few days, I’ll go back to work on the game, and post an update. 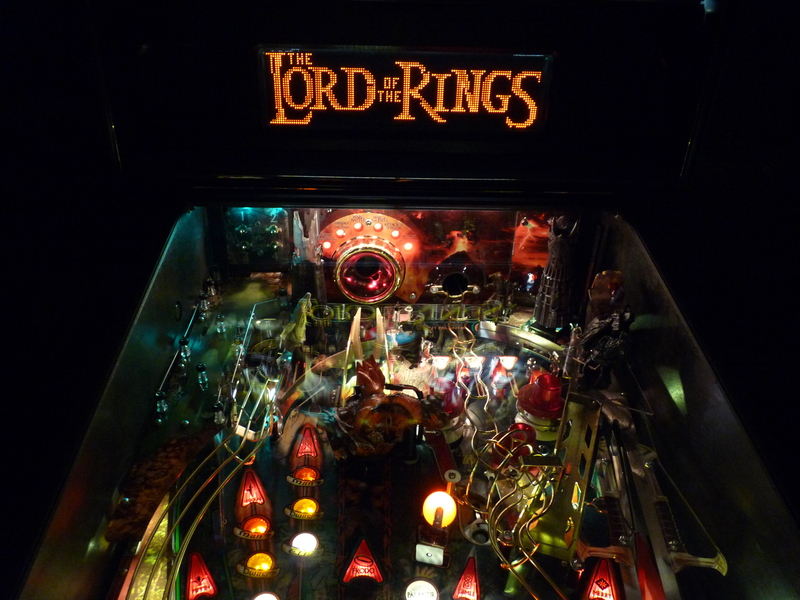 Now that the game is back in the arcade (and I have no idea where the screw that jammed the Gollum/Gimli upkicker came from…sigh…), I wanted to make a post about the changes that have been made to the game. First, LED lighting has been installed, and for the most part I like it. The general illumination lighting is noticeably ‘colder’ than with incandescent lights (which is why we kept incandescent lights on the back arch of the game), but I don’t think it looks bad. 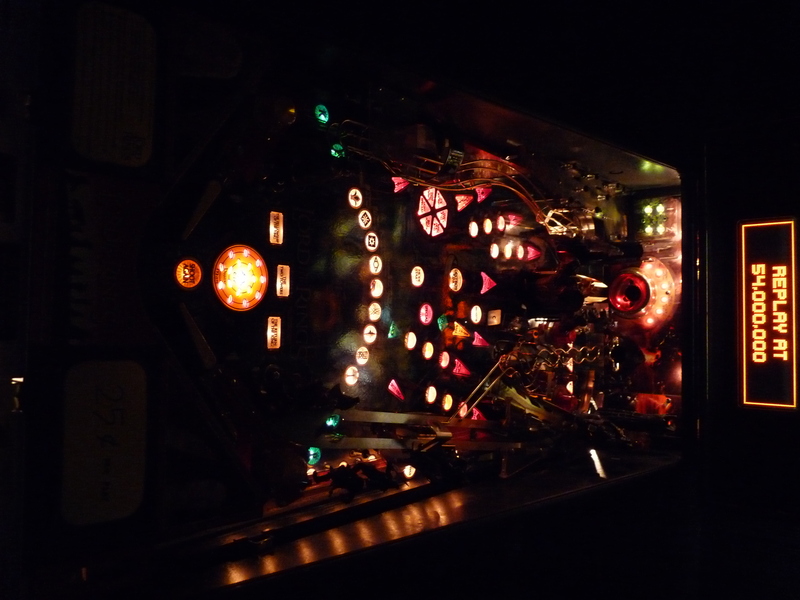 I LOVE the bright colors produced by putting colored LEDs under the playfield inserts, and am looking forward to rarely having to change a bulb (there are a couple lights out right now, which is caused by the new bulbs not being an exact fit. This should be easy to correct). Second, as was done on the Simpsons pinball machine, we switched the side rails to the newer kind that covers the flipper area, which both looks and feels better. 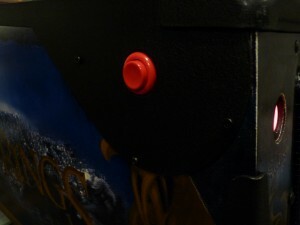 Sadly, the newest pinball machine, Big Buck Hunter Pro, is shipping with the older side rails. I understand the need to keep production cost down, but personally don’t believe this is the place to do it. 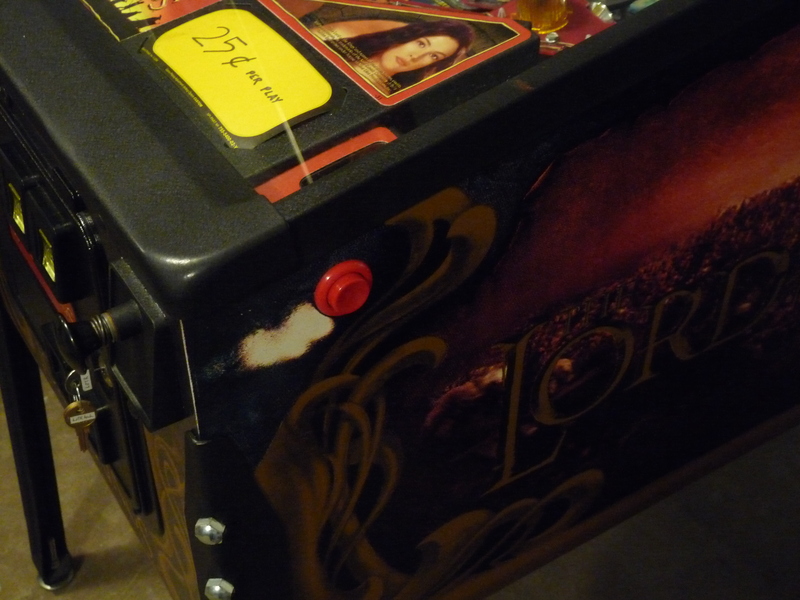 Third, we installed Pinbits plastic protectors to help prevent the playfield plastics from becoming broken. I love the protectors, having had to replace plastics on Lord of the Rings and Spiderman that would never have broken if I’d installed these first. Given that the replacement parts are more expensive than the protectors, I consider them money VERY well spent. 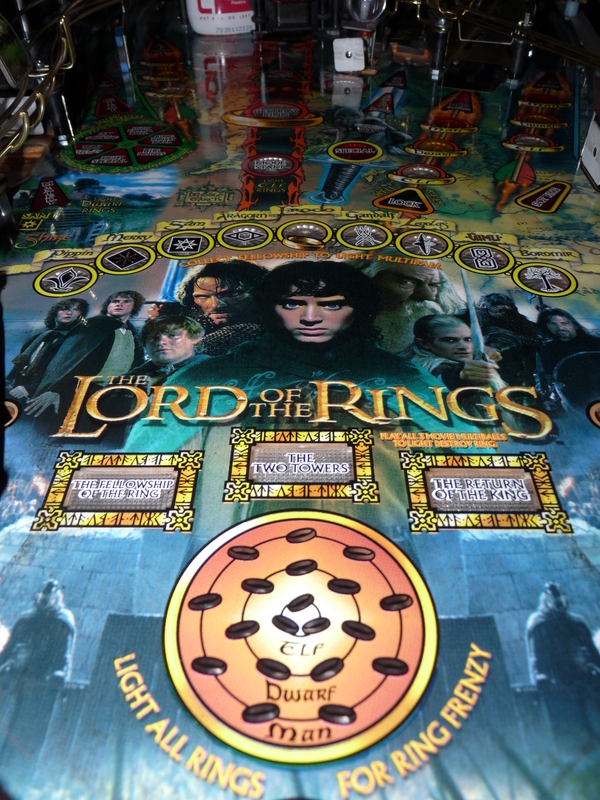 And forth, the new product that will be installed in all of the pinball machines at the shop. 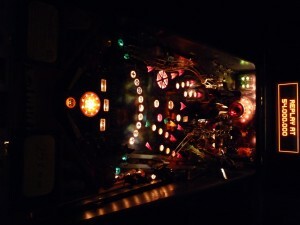 A DMD glare filter. The before and after picture should say everything for me (or looking at the pin in person, then looking at the pin next to it). Glare on the upper playfield from the DMD is something that I, as a player, hate, and this product is easy to install and eliminates the problem. 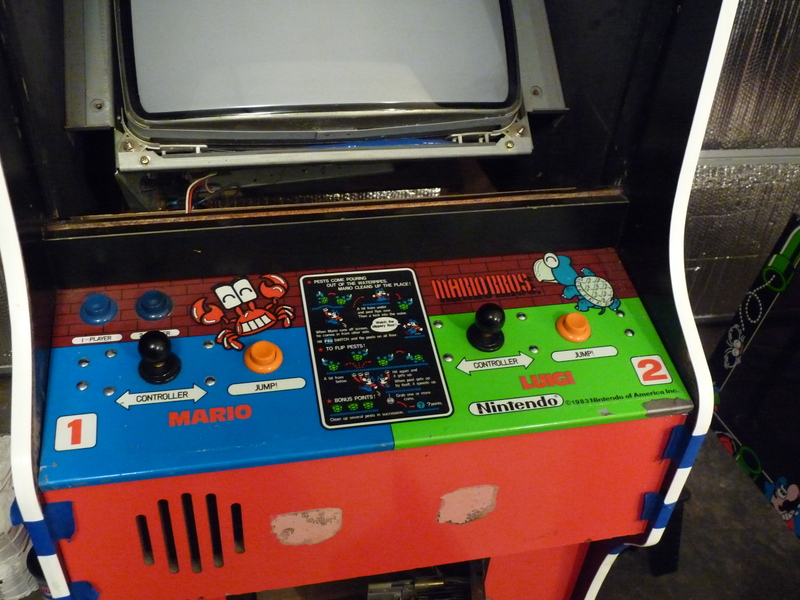 Donkey Kong 3 is back in the arcade following extensive repairs to the monitor. 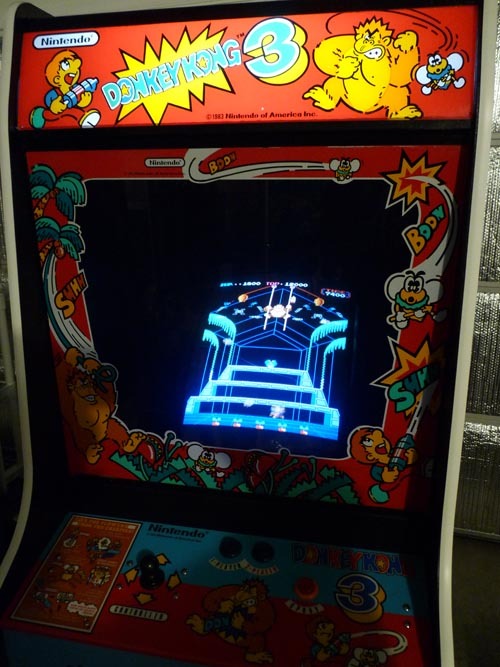 Road Blasters has also returned, again following monitor repairs. 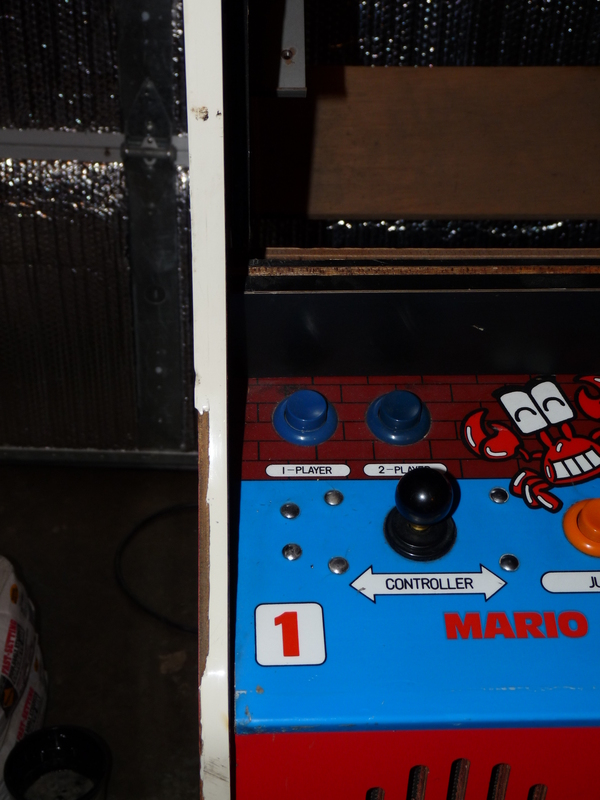 The foot pedal has also been repaired, so the game should be one heck of a lot more fun now! Chase H.Q., meanwhile, has been removed, to be auctioned for charity in October. Details will be posted as soon as I can look the game over to make sure it’s ready. 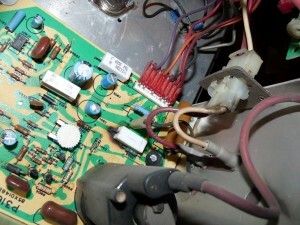 Simpsons looks like it will be an easy repair, so expect it back up and running in the next couple days. If it is an easy fix, I can FINALLY go back to work on Addams Family. And finally, a note on Guitar Hero. We will be looking at the earnings reports for the machine, and figuring out if we can drop the price on the premium games. Best way to vote for a price drop? 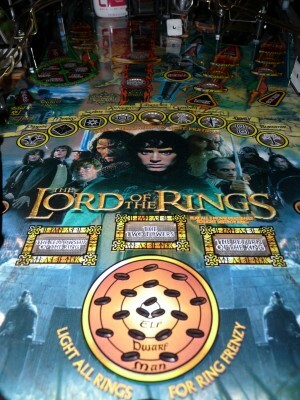 Play the normal songs and let Dan know, politely, that you would like the price to drop on the others. A quick pinball restoration (Star Wars Trilogy, which will get it’s own post soon) turn out to be anything BUT quick. Snow bad enough that we couldn’t actually get into our workshop followed by the shop flooding (with the water pooling and flowing everywhere EXCEPT where it would damage anything important, so it could have been MUCH worse, just took a long time to dry). Me type up a large post about adding the Global Arcade Classics machine, Star Wars Trilogy Arcade, and Marvel Vs. Capcom 2, and not realise I hadn’t hit post until MONTHS later. And then a medical issue came up that ground everything to a screaching halt for a few months. Carrie is all better now, and we’re back to full speed. In the last few weeks, I have been tackling the much-neglected pinball machines, which will each get it’s own post soon, and today we added a new game to the arcade, GUITAR HERO ARCADE! More updates to come after I’ve slept, starting with a better writeup on Guitar Hero.